In addition to their foraging activities, pikas also will engage in 'kleptoparasitism,' stealing vegetation from the hay piles of nearby pikas. The collared pika (Ochotona collaris) is the only species of pika found in Alaska. Closely related to hares and rabbits, pikas are charismatic but lesser known members of the order Lagomorpha. The word pika is derived from the Siberian name for this animal, puka. In North America, they also are called "rock rabbits," "coneys," and "little chief hares." All but two of the 30 living species of pika occur in Asia, where they probably originated. 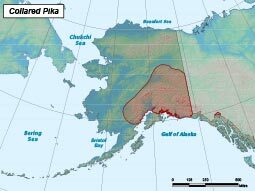 Fossil pika remains and fossilized pika scats are known from several locations in Alaska, including Cape Deceit and the uplands near Fairbanks. Pikas have stocky bodies, short legs, large round ears, and are almost tailless. A distinct grayish patch on the shoulder and neck forms the "collar" from which the collared pika derives its name, appearing in definite contrast to the white fur on its chest and stomach. Pikas have fur-covered feet, but bare toe pads. Their sharp, curved claws help them climb from rock to rock with ease. Pikas are highly alert, possessing excellent hearing and vision. There is no discernable size difference between males and females. When fully grown, they weigh about 5 ounces (140 g; range 110–220 g). Unlike their Asian relatives, who inhabit and defend territories as mated pairs, North American pikas are individually territorial. During the spring breeding season, their aggressiveness and sense of territoriality are at a low—a marked contrast to most territorial mammals. Individuals tend to mate with their nearest neighbors, in a system that is considered to be ‘facultatively (functionally) monogamous.’ The peak of the breeding season occurs in May and early June as snow begins to melt and the first green plants of the season start to appear. Female pikas can breed and produce young at about one year of age. The young are born blind and nearly hairless after a 30-day gestation period. Litters of one to four are cared for by the mother. Female collared pikas generally give birth to one litter a year. Although some reports suggest that they may be capable of producing a second litter (the other North America pika species produces two litters a summer), this has not been confirmed. Young pikas grow surprisingly quickly, reaching adult size after only 40 to 50 days. Young of the year experience particularly low overwinter survival, which constitutes the major source of mortality. The average natural life span for a pika is three years. Pikas are generalist herbivores, feeding on the stems and leaves of various grasses, forbs, and small shrubs. They are renowned for their highly-developed haymaking behavior. By late June, pikas begin periodically clipping or pulling up stems and twigs, which they carry back to their territories in their mouths and store under overhanging rocks, in crevices, and along the edges of boulders. Male pikas begin haying first, followed by females and eventually juveniles. As summer advances, haymaking becomes the dominant activity, and the tiny haystacks become progressively larger. Collared pikas rarely forage more than 10 ft (around 3 m) from the talus, a predator-avoidance behavior that creates a distinct grazing-line visible by the end of the summer. In addition to their foraging activities, pikas also will engage in ‘kleptoparastism,’ stealing vegetation from the hay piles of nearby pikas. During this time they become less tolerant of their neighbors and vigorously defend their vegetation caches and territories by scolding and chasing one another. At the same time they become far less cautious and can often be approached quite closely by humans. Pikas do not hibernate, and their survival during the winter is dependent on the success of their haying season. Each pika may make several haystacks within its territorial boundaries but will usually concentrate on a single main stack, which by late August may be up to two feet high and two feet in diameter. The piles of hay are often partially exposed to sunlight, allowing successive layers of hay to cure. Although individual turnover within a colony occurs, territory and hay pile locations remain fairly stable. Little is known about what pikas do in the winter, although they are sometimes seen sunning themselves on large rocks on clear days. Presumably, they divide the rest of their time between feeding, chasing off other pikas trying to raid their hay piles, and resting up for the next haying season. Pikas are diurnal, being most active during the morning and late afternoon when their short, shrill bark not only advertises the boundaries of their territory but also warns other colony members of intruders. Pikas rely heavily on their sharp eyes and hearing to warn them of potential predators. When one colony member gives an alarm call, others immediately dive into their burrows or escape into tiny spaces between the rocks. Pikas also respond to the alarm calls of marmots and ground squirrels, and will look up and attempt to identify the threat. Ermine (Mustela erminea) are the most persistent and successful predators of pikas. 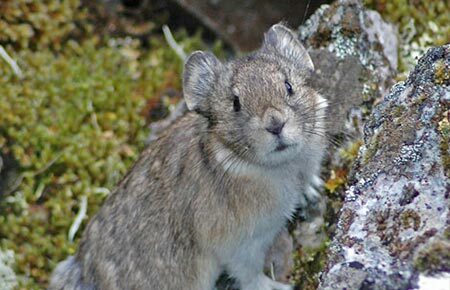 Their small size allows them to pursue pikas into burrows and among the rocks. Marten (Martes americana) also hunt pikas on occasion. Other predators include hawks, eagles, and owls. Pikas respond differently to different predators. When a hawk, marten, or other large predator appears, pikas call loudly to warn others and then disappear into the rocks. When a weasel is detected, pikas are silent, unwilling to attract the attention of this smaller predator which can follow them into their burrows. Pikas also are affected by parasites such as bot fly larvae. Developing from eggs laid beneath the skin, the larvae produce lesions under the skin. Fleas, mites, and nematodes also are known to parasitize pikas. Pikas form colonies in mountainous terrain, living in old rock slides, talus slopes, or around large boulders, usually with a meadow or patches of vegetation in the vicinity. They are normally found at high elevations, but isolated populations near sea level also have been found. Small burrows at the edge of rock piles and the presence of small (BB-size), dark, oval droppings indicate the existence of a pika colony. The presence of their "hay piles" will positively identify the colony. Most of the current work investigating the effects of climate change on pikas has been done with the American pika (Ochotona princeps), which is found in the Sierras and Rocky Mountains in Canada and the contiguous United States and is separated from the collared pika by a 500 mile (800 km) gap. Researchers analyzing archaeological sites in the Great Basin, which stretches from central Oregon south to Las Vegas, and from Reno in the west to Salt Lake City, report that pikas have been pushed to higher elevations over time. Seven of the 25 historically described populations of Great Basin pikas appear to have been extirpated by the end of the 20th century. The average minimum elevation of surviving populations has shifted from historical elevations of 5,741 feet to 8,310 feet. Studies conducted in Yosemite National Park in the Sierra Nevada Mountains adjacent to the Great Basin have found a 1,700 foot upward retreat in the elevational range of pikas over the past 90 years. Although found as low as 7,800 feet in 1910, pikas are now restricted to elevations of 9,500 feet or higher in Yosemite National Park today. As climate change continues, pikas throughout the West may be running out of habitat. It is possible that climate change will have similar effects on collared pikas in Alaska and western Canada. Collared pikas rely on consistent snow pack to provide insulation during the winter months, and warmer winters may cause local extirpation. Aberrant mid-winter warming in the Yukon Territory contributed to 90 percent mortality in the only population of collared pikas being monitored over the long-term. Pikas and other alpine species are particularly vulnerable to climate change since they cannot endlessly move upslope as temperatures warm without eventually running out of habitat. As they are largely restricted to small, disconnected “sky islands” of habitat in numerous mountain ranges, it will not be easy for populations to move to more northern latitudes as average temperatures increase. Individuals typically do not move large distances, and may spend their entire lifespan within a one km radius. Females give birth once per year to litters of 1–4 young.